How the Mile-High City bolstered public and private support for a $5.5 billion mass transit project, connecting Denver to its suburbs and finally putting the entire region on the fast track. 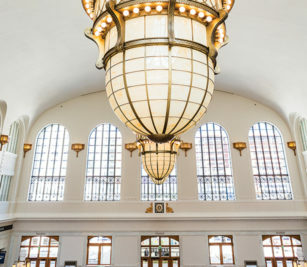 Denver’s Union Station is a stately presence in lower downtown, bustling with travelers pulling suitcases beneath massive historic light fixtures and local workers and entrepreneurs enjoying quinoa salads on the plaza. The transit hub feels like the landmark rail stations of Europe, but it wasn’t always this way. Once dingy and dark, stranded far from the business of downtown, Union Station just a few years ago was a place to catch a bus or train or disembark and then escape as quickly as possible—except for the homeless, who used its hard wooden benches as nap sites. A combination of good luck, bad luck and a lot of collaboration brought Denver to this point. FasTracks hasn’t solved all of the Mile-High City’s transportation issues—traffic is still a hassle, mass transit within the urban core needs attention and some suburbs still wait for rail service. But the magnitude of the project and the process of achieving it have forever changed Denver, while providing cities across the country with a compelling development model. Back then, as Denver headed toward the new millennium, population growth projections were fueling forward-thinkers. Denver mayor Federico Peña urged residents to “Imagine a Great City.” It was a catchy slogan, and it helped boost support for growth. Major public works projects followed, such as the Denver International Airport, a new convention center, the arrival of Major League Baseball with the Colorado Rockies and construction of three new sports arenas. Famous for its “brown cloud” of pollution and a traffic-jammed rush hour, Denver planners knew that traffic mitigation would be a major part of managed growth. Without a public transit element, Denver would never achieve Peña’s vision. 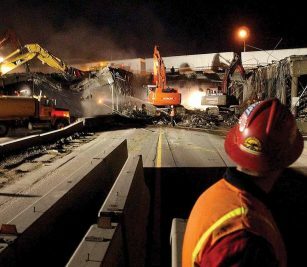 Building on that momentum, RTD partnered with the Colorado Department of Transportation and collaborated to jointly fund a massive project—named the Transportation Expansion, or T-Rex—that would widen the highway and include a railway project alongside I-25. T-Rex was completed in 2006, on time and under budget, with ridership 40 percent above projections. “Once again, it was proof of concept,” says Reed. But RTD’s projects weren’t all home runs. In 1997, its initial $2 billion rapid-transit plan, “Guide the Ride,” failed with voters. It would take seven years, a trip back to the drawing board and the backing of a popular new mayor—John Hickenlooper, now Colorado’s governor—to resuscitate the idea. Hickenlooper secured the support of every mayor in the region by convincing local governments that FasTracks would benefit everyone, not just the city of Denver. In 2004 the voters signed off and the city embarked on what was then the country’s largest rapid-transit initiative. Four years later, in the midst of construction, the recession hit. RTD found itself with increasing costs and decreasing revenue and variables like the construction demands of the Beijing Olympics pumping up the cost of raw materials. The team managed to secure a major federal grant to cover some of the deficit, and RTD altered its project-funding process and the timeline of the voter-approved master plan. The biggest adjustment would be adopting a public/private partnership for many elements of the project. RTD created an owner/operator relationship with Denver Transit Partners, a consortium of private companies and investors, to design, build, finance, operate and maintain the new rail lines. The two entered a 34-year contract where RTD maintains ownership and pays DTP monthly for their up-front financing of nearly $450 million. The private sector was also invited to participate in development of the new rail stations—and experienced downtown innovators were eager to be involved. “As developers in this part of the central city, we believed it was important to take an active interest in the infrastructure to make sure the path taken to build out the infrastructure wouldn’t diminish the immediate neighborhood, but enhance it,” says Mark Falcone, CEO/founder of Continuum Partners, which along with fellow downtown developer East West Partners served as master developers of the Union Station redevelopment. Even with daily average ridership of more than 200,000 riders, there have been missteps. The rail extension to Boulder and Longmont has been delayed until 2042, although a rapid bus line serves that region. Currently, the University of Colorado A Line is plagued with signal-timing issues—traffic gate arms are falling too early and rising too late, which forced the operator to employ round-the-clock human supervisors. The Federal Railroad Administration has put the A Line on safety waivers, which means the 11.2-mile Gold Line extension to Arvada is on hold. The Gold Line—aka the G Line—was expected to begin service in October 2016, but despite the delay, Arvada is reaping the benefits of FasTracks in its community. “The positive momentum in terms of economic development started to radiate like a rock in a pond,” says Mark Deven, city manager for Arvada. The most significant project is a $60 million renovation of the nine-acre Park-n-Ride facility. The project will include mixed use, office and residential units. In the neighborhood adjacent to the new station, an additional $145 million in various commercial developments are underway. Also clamoring for a train, stakeholders in the southeast suburbs have committed $35 million to $40 million in cash and right-of-way grants to extend FasTracks 2.3 miles to the city of Lone Tree. That contribution exceeded RTD’s requested 2.5 percent local match by almost 15 percent. The planned 2019 completion date is just an estimate, but Charles Schwab & Co. recently opened a three-building campus near the new Lone Tree station that will have the capacity for 5,000 workers. Residential real estate is also gravitating to transit. DRCOG reports that between 2010 and 2015, 50 percent of new multifamily home builds occurred within one mile of existing or under-construction transit. During that same period, 46 percent of new jobs were created within one mile of existing or under-construction rapid transit. Business leaders see the success of the transit projects as a reflection of Denver’s wide-open sensibility. “I think it’s important to point out that there is a long history in this region of citizens supporting infrastructure,” says Continuum’s Falcone. 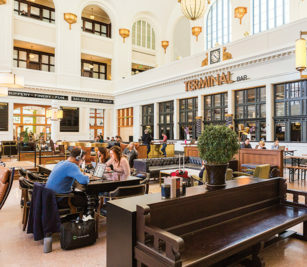 “It was the citizens of Colorado who gave their civic leadership the authority to do this.” Falcone himself lives just blocks away from Union Station as does Mark Smith, founder and development partner of East West, which developed the station.